One of the projects that I am currently developing is close to my heart- It is a parcel of land where my wife and I would like to build our final house. We found it by looking at rustic parcels on the edge of town from aerial photographs. After identifying one possibility, we pursued it with the current owner and were able to purchase it for a reasonable price. It had a lot going for it: close proximity to town, access to paved roads, complete privacy, some great existing trees and an existing (although drained) pond. It also had some issues- the upper flat portion (about 4 acres) was completely covered with cedar trees, and there was an abandoned house that had mostly collapsed and needed to be removed. 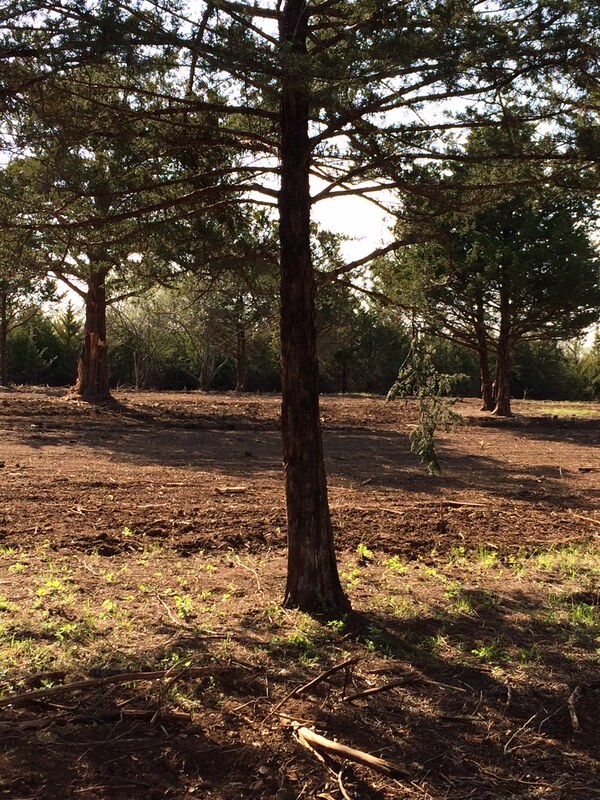 In order to actually see the property, we started by removing the house and its foundation and septic tank, and bulldozing the majority of the cedar trees, just keeping the significant ones. 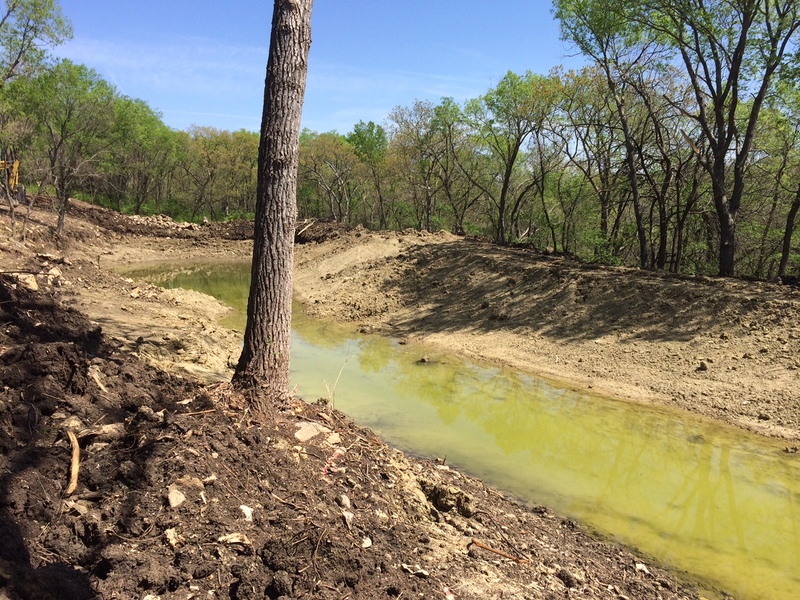 We cleaned out and deepened the pond, and rebuilt the dam that had been opened up a long time ago. 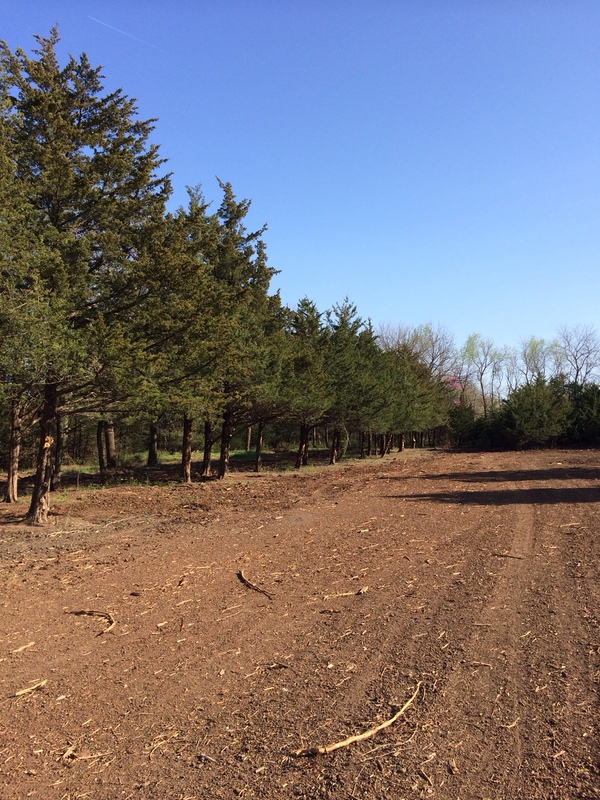 The end result of the demolition phase was just what we were seeking- a property that featured groupings of trees with wide open spaces between them, one large sentinel red oak, and two rows of mature cedars that create an interesting tension in the gap between them. The pond covers three fourths of an acre and is sixteen feet deep at its deepest, and is spring fed in the rainy season. Presented with large expanses of raw topsoil, I knew that I needed to get the ground layer under control quickly. Given the rural feel, this landscape needs to be very different from my current garden- softer, gentler, and very low maintenance, without any necessary irrigation. 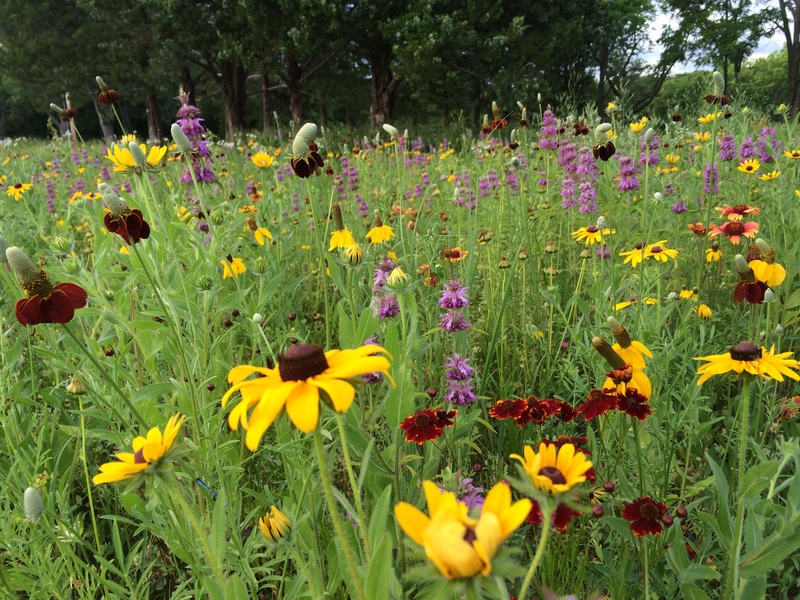 I turned to a Nebraska seed company called Stock Seed Farms that specializes in native grasses and wildflowers, and purchased their Roadside Mix. 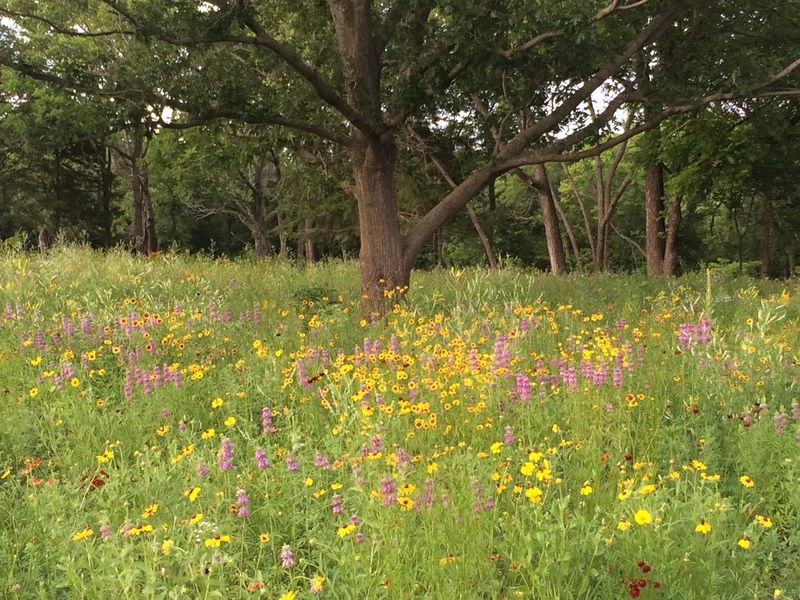 This is a mix of both native and introduced wildflowers, and short prairie grasses. I hired a grading company to smooth out the exposed soil, and they then drilled the seed into the soil and covered it with a thin layer of native grass hay. We then waited for the spring rains… which never really came. 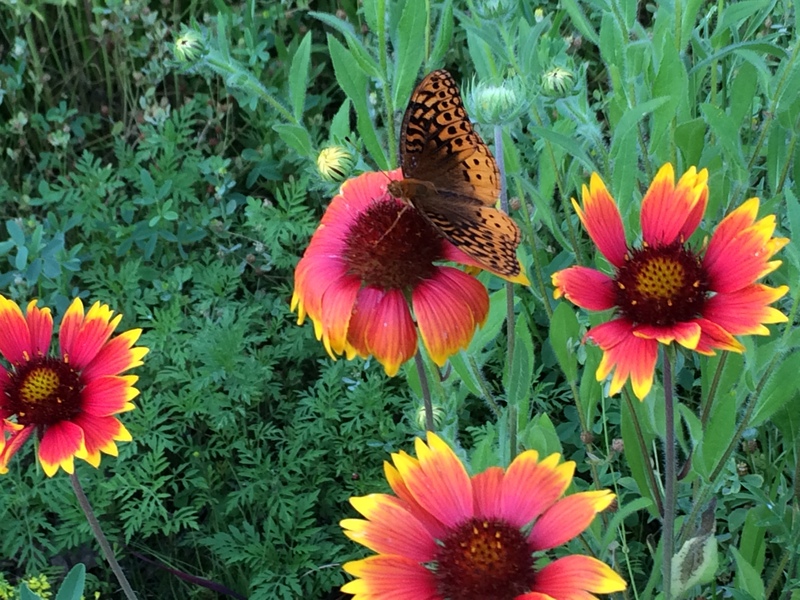 It finally started raining in late June and early July, and while a few things bloomed sparingly (there is an annual wildflower component that will bloom the first year included in the mix), not a lot was happening, and I was a little apprehensive. However, in mid- August, I noticed that lots of little perennial seedlings had appeared, and seemed to be doing pretty well. Encouraged, I tried to put my concerns aside and wait until the next spring to see what would happen. After a fairly mild and very dry winter, I started waiting and watching the wildflower plants. 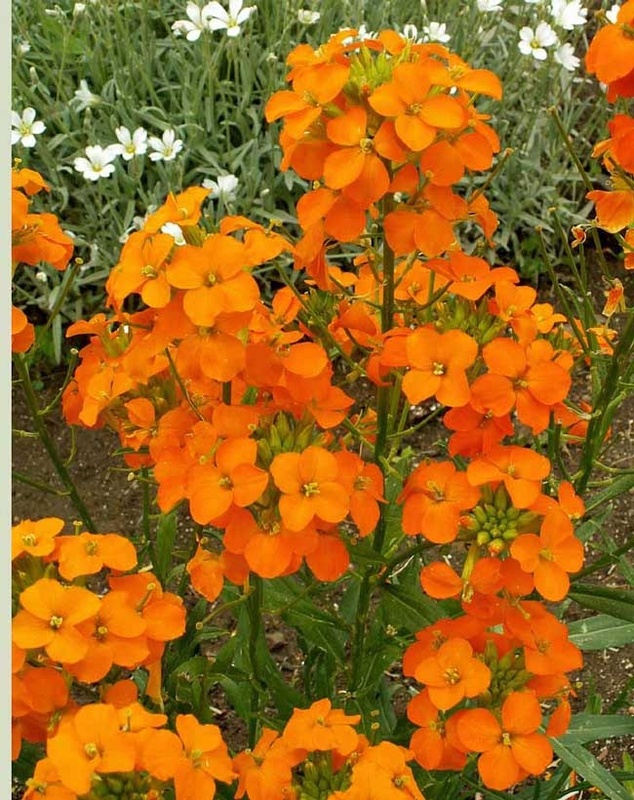 The first to bloom was Siberian Wallflower, and they bloomed for about two weeks in late April and early May. They are a somewhat odd color that I wasn’t really expecting, but I found that they were a long lasting flower, and I decided that I liked the color by the end of their bloom. 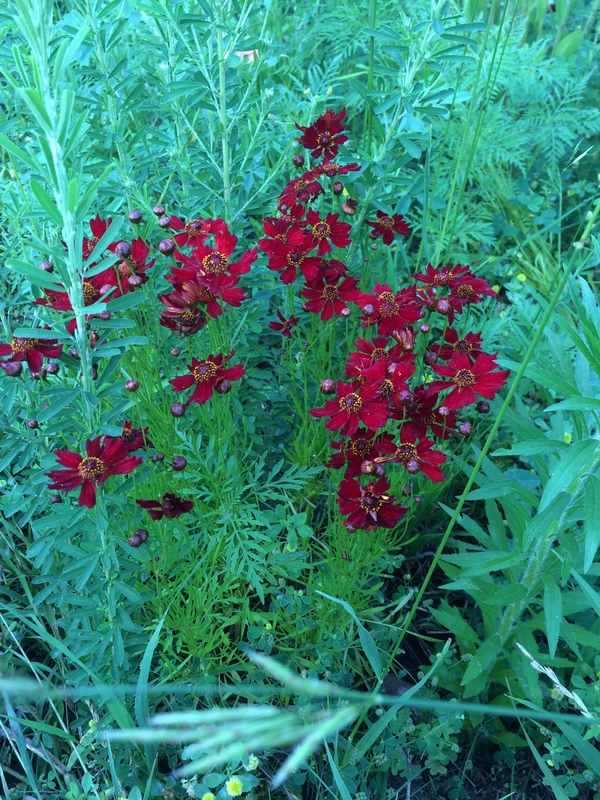 Second to arrive was the Lance Leaf Coreopsis, and it coincided with what ended up being two months of heavy rain. 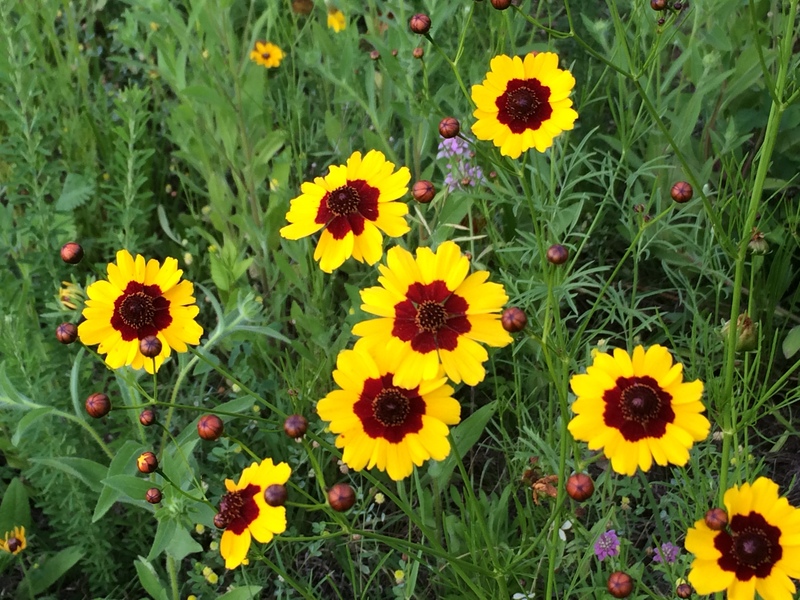 The coreopsis loved all of the moisture, and they bloomed for about three to four weeks. The fore-mentioned rain really caused all of the wildflowers to just explode, and the show for the past few weeks has been pretty amazing. 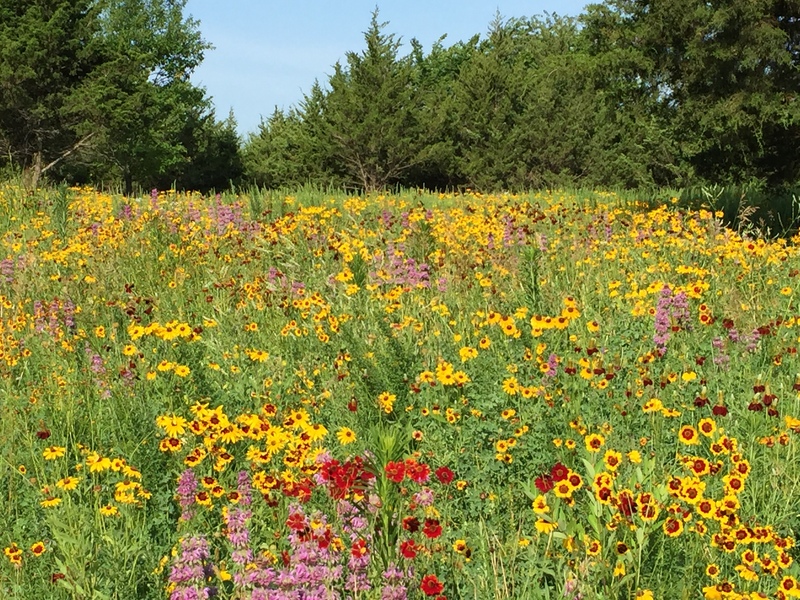 Right now, it is just a sea of yellow Black Eyed Susan, purple Lemon Balm, yellow and burgundy Dwarf Blanket flower, yellow and red Plains Coreopsis, and burgundy Mexican Hat. The contrast between the before and after shots, taken a year apart, is pretty amazing. The only negative aspect of this experiment has been the emergence of both yellow and white tall clover, which I don’t like. 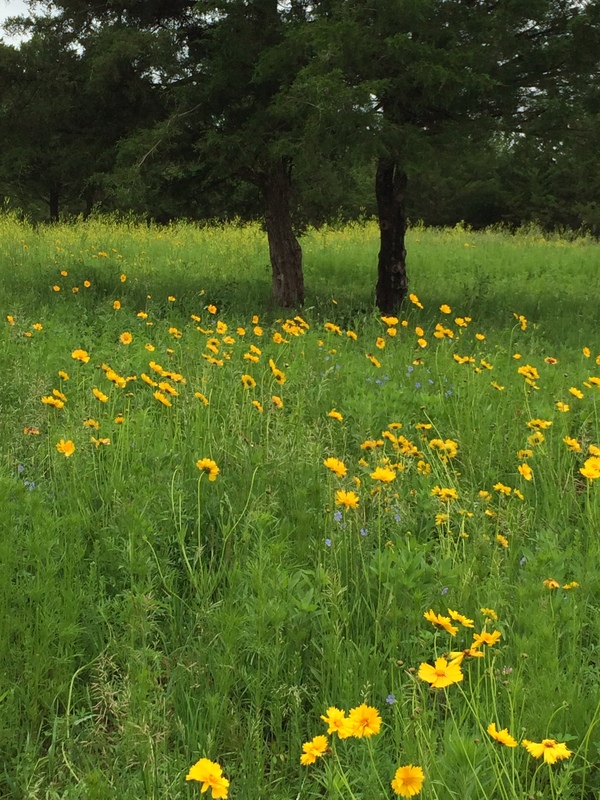 I have had some of my employees pull a lot of those by hand when it was too wet to do anything else, and it changes the looks of the wildflowers significantly for the better. I’m not sure if they were part of the seed mix, or if those seeds were already lying dormant in the soil. Whatever the source, they tend to overwhelm everything else, so I will continue to try to eradicate them. It is now the end of June, and the rains have finally stopped. 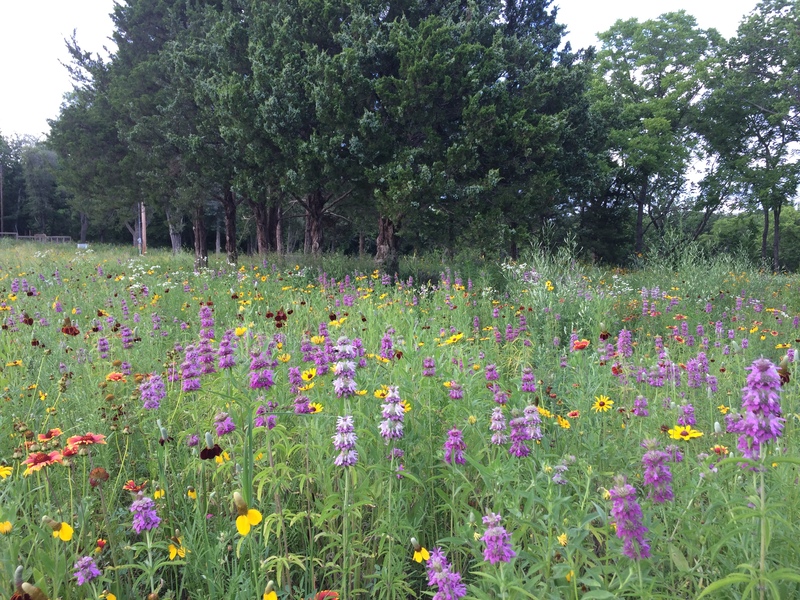 Many varieties of flowers are still in full bloom, and the quick onset of heat in the upper nineties hasn’t seemed to impact the wild flowers at all. 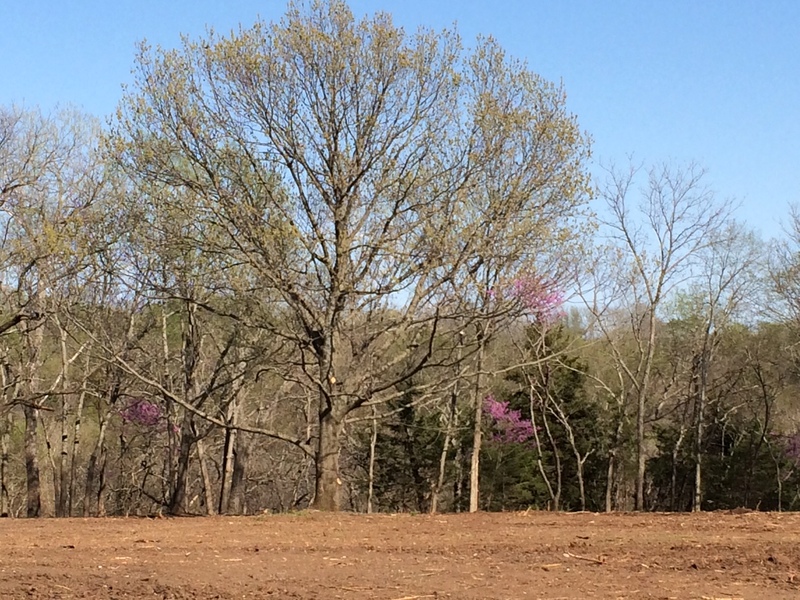 I am very excited about the progress that has been made in creating this beautiful, low maintenance landscape, and I will continue to update the seasons as they progress.